When a person dies leaving a will, the executor of the estate will usually submit the will to probate as the start of the probate process. Not every will in New York State must go through probate, however. Some assets automatically skip probate and pass through joint ownership or “in trust for” or “pay on death” accounts, among others. If the assets that have no such named beneficiary are below $30,000, the family may proceed with a small estate administration with the will attached instead of probate. The probate process begins when a petition for probate is brought. Interested parties can sign a “waiver and consent” or the court will issue citations that are served on all interested parties (including people who would inherit if there wasn’t a will, etc.). These people may request depositions of witnesses to the will and the attorney draftsman and they may file objections to the will. Assuming that no one objects and the Surrogate Court is satisfied, it will issue a court order or decree formally granting the probate and issue Letters Testamentary to the named executors. New York probate litigation is the process whereby someone contests one or more provisions of the decedent’s last will and testament, a codicil (i.e., a document which subtracts from, adds to, or somehow changes the decedent’s will), or the executor’s appointment. The experienced New York probate litigation attorneys at Goldfarb, Abrandt, Salzman & Kutzin LLP can represent you during a will dispute and work towards obtaining the legal result you desire. Who May Contest a Decedent’s Will? According to wills and estates law in New York state, spouses and children of the decedent, along with other individuals the decedent specifically mentioned in the current or previous versions of their will, may be able to contest the decedent’s will. Additionally, anyone who may have inherited had there not been a will or who would have benefitted under a prior will can contest the probate. A will contestant may be able to challenge the validity of the will in question, as well as the will’s construction or wording. A will contestant may also be able to challenge whether a previous will should be valid instead of the will submitted to probate. The decedent and/or the witnesses did not sign the will in accordance with the requirements established under New York law. For example, one of the witnesses may not have properly witnessed the will in the presence of the other witness, as required by law. The decedent was lacking “testamentary capacity” at the time he or she executed the will. This is another way of saying that the decedent was not of sound mind at that time or that the decedent did not know what he or she was doing at the time the decedent executed the will. The decedent did not make the will freely or voluntarily. In other words, the challenger may allege that at the time of execution, he or she was the victim of some sort of undue influence or fraud. The challenger may also claim that the will in question was a forged instrument. Two competent or otherwise sufficient individuals did not serve as witnesses to the signing of the will in question. There are several situations where probate litigation in New York may be necessary. When one of these situations arises, the appropriate Surrogate’s court will oversee the resolution. Probate litigation may be necessary in cases where the decedent was married more than one time or where there is sibling rivalry over the assets remaining in a decedent parent’s estate. Complications may also arise in cases where the decedent did not have a standard estate plan. These non-standard estate plans often include plans which do not account for a certain child or children. In such cases, one or more children may bring a will contest before the court to challenge the issue of testamentary capacity. This is because most wills specifically name and exclude a child instead of forgetting about a child altogether. Litigation is necessary in cases where parties contest the will. 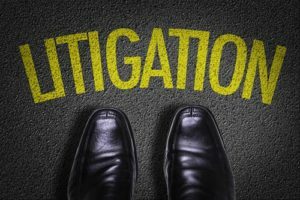 The length of the entire probate litigation process depends largely upon the disputed issues, as well as the number of individuals who are contesting the decedent’s will—and the reasons for those will contests. Litigation is also sometimes used to resolve a situation where a fiduciary does not act according to New York state law. The same is true in cases where a fiduciary refuses to act according to the provisions set forth in the decedent’s last will and testament. Probate litigation can be a very lengthy process that may take many months to play out and resolve. Moreover, probate laws in the State of New York can be difficult for a non-attorney to understand. Fortunately, the skilled lawyers at Goldfarb, Abrandt, Salzman & Kutzin LLP are here to help. Our knowledgeable team of attorneys can review your unique circumstances and determine the basis for the challenge or dispute. Our lawyers can then represent you throughout the litigation, attend all legal proceedings with you, and advocate on your behalf at those proceedings. We can work towards bringing the litigation to a fair and favorable resolution. To schedule a free consultation and case evaluation with a New York probate litigation attorney, please call us at (212) 387-8400, or contact us online today.